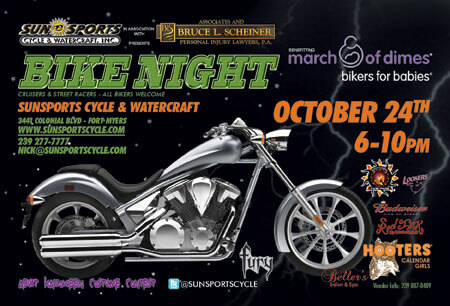 Sunsports Cycle and Watercraft, in association with Associates and Bruce L. Scheiner hosts Bike Night this Saturday, October 24th from 6pm until 10pm. Sunsports Cycle and Watercraft is located at 3441 Colonial Boulevard in Fort Myers. All bikers are welcome. Organized as a fundraiser for the March of Dimes Bikers for Babies, Sunsports has pulled out all the stops to give the motorcycle community something special on Saturday night. UFC fighters, David Loiseau and Vernon White will make appearances at the event; the Calendar Girls from Hooters will be there selling their calendars and “dressing up” the event; and there will be a Halloween Costume Contest, so come in your best costume. Vendors, beer, food, great deals…what more could a biker need? But, if that isn’t enough, from 3:30pm until 6:30 pm Sunsports is having a Bike Wash and all proceeds are being donated to Bikers for Babies. Bike Night happens… click to see more! Tailpipes rumbled and music played on Saturday, October 3rd, when Cape Coral’s first Bike Night of the season rolled into downtown’s “restaurant row.” A popular event for bikers and bike lovers that draws thousands of enthusiasts into the Cape’s 47th Terrace business area. This month’s Bike Night happened thanks to the support of some prominent local businesses. “We are proud to show our support of the local motorcycle enthusiasts’ monthly events. 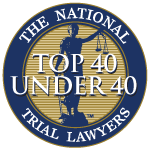 We enjoy being a part of it and meeting so many good people”, said Bruce L. Scheiner, founder and senior attorney of the personal injury law firm that bears his name. This year, the City of Cape Coral’s Parks & Recreation Department, like most municipalities, has been experiencing budget concerns, so it was crucial for local sponsors to step up in order to keep the event rolling. 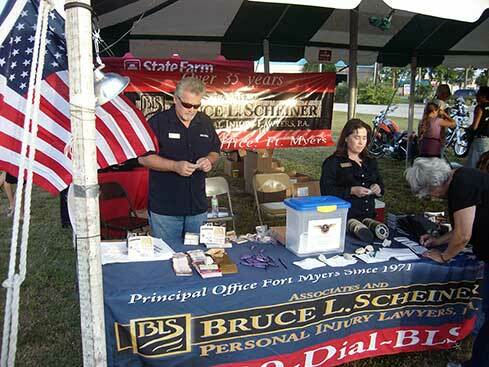 As the Title Sponsor, Associates and Bruce L. Scheiner, Personal Injury Lawyers manned a booth at the show to hand out information about motorcycle rider safety, and show bikers that it cares about smart riding practices. “Southwest Florida is a terrific place to enjoy riding a motorcycle. We feel it’s an honor to share valuable information on rider safety with those who feel the same way”, noted Scheiner.